To enable shift swapping please go to Manage My Business » General » Manage My Schedule Settings and Time Card Settings. Mark “Allow employees to see the schedules of employees in their department”, this will allow employees to see each other schedules in View My Schedule. This section has to 2 options to require (or not) manager/supervisor approval. In this section you can select restrictions to allow swift swapping like Competency Match, Pay Rate Match or to prevent overtime. 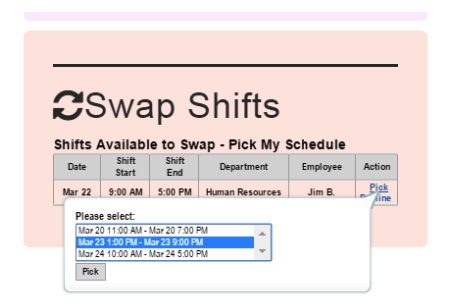 These are shifts offered from View My Schedule to all employees by the schedule owner and the offer is displayed on the main Dashboard landing page. It will be displayed to all employees but emails will be sent only to the employees that meet the requirements and work in the same department. All employees that meet the requirements will get a message (Dashboard landing page), allowing them to take or ignore it. Please note that in this case we selected to ask for supervisor’s approval. Only Supervisors from the involved department will receive an email, and the Swap Shift confirmation screen (Dashboard landing page) to approve or decline the request. This option will send emails to all employees that meet the requirements and also have a shift to swap on a different date. Employee A offers a schedule to exchange it. Employee B checks the message in the landing page, there is an option to select the schedule to exchange, in this case March 23rd. Please note that in this case we selected to ask for supervisor’s approval. Only Supervisors from the involved departments will receive an email, and the Swap Shift confirmation screen (landing page) to approve or decline the request. Supervisors will receive a message in their landing pages that will display both schedules and dates. Employee B receives the message and decides to approve or decline it. Please note that in this case we selected to ask for supervisor’s approval. Only Supervisors from the involved department will receive an email, and the Swap Shift confirmation screen (landing page) to approve or decline the request.